In the world of video games, the level of hype and craze soars to greater heights every year when the latest version of a particular game is released. Fortunately or unfortunately, the world we live in has evolved from the days when outdoor sports were the most pleasurable; and playing games on PlayStations or Xbox is the new trend. The producers of the games leave no stone unturned when it comes to maintaining the interest of the target audience in their respective games. A newer version every year, with updates for all the team squads, stadiums etc. and improved graphics and gameplay ensures that people eventually do move on to the latest version no matter how much they like the previous one. When we speak about NHL 10 and NHL 11, which are very popular, we are in fact referring to two versions of the National Hockey League that come as video games. The NHL series is developed by the all so famous EA games and published by EA Sports. NHL 10 is the 19th game in the NHL series. It made its debut on Fest’09, in a three day festival that celebrated the sport of hockey as well as the Los Angeles Kings. It took place from 28th to 30th August in LA. NHL 10 was the first game in the NHL series that was not released on PC. Moreover, it was released on the PlayStation 3 and not on PlayStation 2; the first NHL game after NHL 2000 do so. Later on, when NHL 11 was released, gamers shifted to the newer version and as a final push to move each and every gamer possible to the newer version, all online services for NHL 10 were discontinued in effect from October 1, 2011. The NHL 11 was released in celebration of the twentieth anniversary of this series. This game also had the same producers and publishers as NHL 10. However, it was released in North America on the 7th of September 2010. All other regions were to get the game within the next two weeks. The biggest change in NHL 11, according to producer Sean Ramjagsingh, was a game engine that was based on the principles of physics. This replaced the old system that was based on animation. The change was a huge leap in making the video game very realistic; for instance, the motion of the players in the games, dictated by the laws of physics, meant that they could not make sudden turns at high speeds and to make precise turns, they had to first slow down. Apart from this, there were other changes as well that included the breaking of hockey sticks and so on. This effect, along with many others contributed a great deal in making the game more and more realistic. NHL 11 was received by gamers with huge delight. The difference between NHL 10 and NHL 11 was greater than between any two consecutive NHL games in the series. The latter had made a great move towards becoming a complete and more realistic video game. Just like all others, as the end of the year approached, an attempt was made to promote the newer version of NHL and by the 11th of January 2013, all of the online services of NHL 11 were discontinued. According to gamer reviews, the gamers who just played this game for entertainment purposes did not take the changes positively; the broken sticks for example was nothing but a nuisance for them. They continued to praise and play NHL 10. The fans of hockey as a sport, however, appreciated the changes and the fact that the video game made it more like a real life match! 1. NHL 10 is the 19th game in the NHL series; NHL 11 the twentieth, marked the twentieth anniversary. 2. NHL 10 made its debut on Fest’09, 2009, in a three day festival that celebrated the sport of hockey in LA; NHL 11 was released in North America on the 7th of September 2010. 3. The biggest change in NHL 11 was a game engine that was based on the principles of physics and replaced the animation of NHL 10 and previous versions; made gameplay more realistic. 4. The gamers who just played this game for entertainment purposes did not take the changes positively; the broken sticks for example was a nuisance for them-they continued to praise and play NHL 10; the fans of hockey as a sport, however, appreciated the changes and the fact that the video game made it more like a real life match. allana. 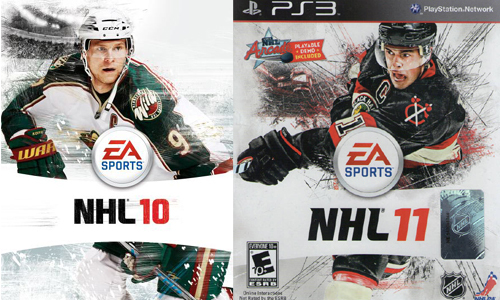 "Difference between NHL 10 and NHL 11." DifferenceBetween.net. December 10, 2014 < http://www.differencebetween.net/object/gadgets-object/difference-between-nhl-10-and-nhl-11/ >.